in and we can take your order. Like the best things in life, Cinenova Grande is created with love for detail, passion for strength and respect for grace. Cinenova Grande conveys audio without interpretation, coloring or compression - True to life. Immaculate sound quality matched with massive power and performance places Cinenova Grande at the top in the heavyweight class of high end multi-channel amplifiers. With 2000 watts dynamic and 1000 watts continuous power per channel, Cinnova Grande is the world's most powerful multi-channel amplifier. It is ideal for both the two-channel high-end enthusiast who wants the benefits of bi-amping, and the serious home theater owner who demands unlimited power even during the most explosive movie sequences. Are you an experienced enthusiast who is not easily impressed? We guarantee your encounter with Cinenova Grande will reignite your passion for audio. All aspects of Cinnova Grande is designed to enthuse the listener with clear audio quality, unlimited power and unsurpassed value. Precision- built quality in harmony with aesthetic design ensures enduring owner pride and lifelong enjoyment. Cinenova Grande is comprised of individual amplifier blocks named Alpha One. The 5 Alpha One module blocks work independently of each other each is a 1000 watt power amplifier itself. Each Alpha One has a 15 amperes supply and is equipped with its own preamplifier and power supply circuits (electrolytes, rectifier, etc.). Alpha One is equipped with 12 ultra-fast 15 GHz, 30 amperes customized Toshiba transistors. This armament allows 1000 watts continuous power and 2000 watts transient response. Cinenova Grandes oversized construction ensures easy, accurate and articulate reproduction of any source material. The special high-speed transistors were developed by Earthquake in collaboration with Toshiba. It has previously been difficult to construct a powerful amplifier that is both quick and articulate as powerful amplifiers typically mean a longer and more complex signal path. The new transistors help to transcend traditional barriers and effortlessly reproduce source material to over 100kHz. The combination of speed, high-power and ability to handle high voltage swing ensures the Alpha One meets its specifications effortlessly. Each Alpha One has a combined transistor current rating of 360 amperes. In addition, a 180 volt DC high voltage supply with an electrolyte bank of over 45 Joules of pure energy guarantees headroom at all times. Cinenova Grandes ability to control a large and heavy sub-woofer cone is unmatched even when compared to exotic 2 channel designs. A damping factor of more than 1,600 means that even large and heavy speakers are dominated with ease. Even the most complex low frequency material is reproduced with dynamic punch and rock-hard control. Cinenova Grande is equipped with a monstrous 4000VA toroidal transformer. Besides its vast mass, there are several things that distinguish it from other audio transformers. It is based on a core of pure ferrite giving the transformer a very high power density and stiffness compared to typical iron cores. The transformer is wound of 99.99% oxygen free copper of 12 gauge thickness. The use of oxygen-free copper as winding material increases the transformer's efficiency and stiffness significantly. The combination of a core of pure ferrite and windings of oxygen free copper elevates transformer power efficiency. This means that only a fraction of flow-through current is converted into heat. The transformer is further unique in its bi-file structure. Bi-File means that each power amplifier module block has its own secondary winding. It isolates the individual module blocks and makes them independent from each others power supply. At the same time making every module blocks secondary winding magnetically coupled to the one large primary winding. This results in a supply stability and stiffness unknown in amplifiers based on several small transformers. The above specified design results in a power supply with a regulation factor of less than 3% at full power. Transformer winding and a special hard coating results in hum free operation. This is further ensured by the transformer mounted in vibration mountings where 10 layers of pressed foam of differing density is used as an insulator. Everyone is interested in saving power for the benefit of both the environment and their wallet. Our engineers are very environmentally conscious and from Cinnova Grandes conception, environmental awareness and efficiency were absolutely essential. It is by nature a necessity to put power into the amplifier in order to get power out of the amplifier. A combination of innovative technologies and precise tuning and calibration led to Cinenova Grande being the market leader in Green Power. A five-channel Cinenova Grande with a total power capacity of 5000 watts continuous has an idle consumption of only 0.25 amps (230 volt). This corresponds to the consumption of a typical fish tank, found in many homes. By comparison, there are other brands of power amplifiers with an idle consumption of over 2 amps, which corresponds to a strong halogen lamp or a small vacuum cleaner. Cinenova Grande is proof that good sound quality can no longer be used as an excuse for excess power consumption. This built-in technology makes Cinenova Grande unaffected by noise from the power grid. This ensures that DC content in the mains is not dissipated as heat and hum in the amplifier's main transformer. Many have probably seen how the activation of a refrigerator compressor can be heard throughout the speakers and how electronic transformers in halogen lights can create noise on the power grid. These noise sources have no influence on Cinenova Grandes performance. The exclusive power conditioner eliminates the need for expensive external power conditioners and related accessories. By exclusively using mil-spec FR-4 printed circuit boards in the Cinenova Grande, problems with "cold" solder joints and PCB warping due to thermal effects or other environmental factors were eliminated. The benefit of this is that the usages and intensity of use is no longer a factor for the amplifier's durability and longevity. To achieve an extremely low resistance and preserve signal integrity the traces on the circuit board are of the 3 ounce oxygen-free copper type. Cinenova Grande is built with understanding and acute awareness of how essential the cooling system is to both the amplifier's performance and durability. A well designed and properly sized cooling system is at least as expensive to produce as an exotic output stage or an extravagantly large transformer. However, it is extremely rare that an amplifiers cooling system is highlighted in the product literature, as it is not considered to have marketing appeal. Each Alpha One power module block has an immense heat sink of extruded and anodized aluminum. With a heat sink surface area of more than 3300 cm2. To put this in perspective, it corresponds to a flat piece of aluminum of 57 x 57 cm. A large surface area is essential for the heat sinks ability to dissipate the heat from the large transistors. A large surface area alone is not enough to constitute an effective cooling system. The cooling system must be designed so that the natural convection (the characteristic that hot air rises) is utilized optimally. In the Cinenova Grande the heat sink is designed so that it exploits the amplifier's full height of 23 cm. This means that heat sink is vertically grooved and extends from the inlet port at the bottom of the amplifier to output openings at the top. This unobstructed chimney design means that air can freely move from bottom to top inside the amplifier and be accelerated unhindered by the natural convection. Just the height of the heat sinks makes the air flow increase exponentially as the air velocity increases for each centimeter of vertical ascending convection. The same heat sink surface area with half the height would have a greatly reduced cooling capacity. The Cinenova will keep cool even with the hardest and most rigorous use. Cinenova Grande is equipped with instrumentation on the front of the amplifier which informs the user about the status of each channel. An orange LED for each channel will light up when the channel's output is within a 1 dB of full power. This is signaled by the LED briefly lighting up (flashes) by transients in the music / movie. The signal is still amplified distortion-free and one should be careful not to increase volume. This information enables the user to utilize all the amplifier's power resources without concern for unpleasant and harmful loudspeaker distortion. With Cinenova Grandes high power capability, only the most extreme users will see these lights flicker. When a channel's output capacity is fully utilized the corresponding diode light up constantly indicating the volume should be reduced. This is a unique feature that allows each channel to be adjusted only to reproduce the users desired frequency range. A three-way switch and a potentiometer controls the filter function. If the switch is set to bypass, the crossover is disconnected and has no function and the channel acts as an ordinary mono output channel. If the switch is set to high pass, the channel will only reproduce the higher frequency range. The intersection of the crossover divider can be infinitely adjusted using the potentiometer. When the switch is set to low pass, it will only reproduce the lower frequency area and the intersection is adjusted in the same manner. Crossover function can be a superb tool for the enthusiastic DIYer, who wants to experiment with parts frequencies. It is also an invaluable feature for users who are experimenting with bi-amping and want control over the spectrum each speaker part sees. Many will find it useful to cut off frequencies below the tuning point on the user's speakers. Added power below this point cannot be reproduced by the speakers and thus constitutes an undue burden. There is often a noticeable sound enhancement benefit by cutting off the low frequencies a small speaker cannot handle. Increased dynamics, detail and power handling are typical areas that will be improved. Another area where Cinenova Grande differs from other amplifiers is its ability to protect itself against even the most extreme circumstances. It is not just technical protection, but protection with detailed instrumentation. Diagnosis of the amplifier's operating condition is a simple visual task. Cinenova Grandes transformer is constantly monitored by a thermal monitoring system. Each Alpha One block module is also equipped with a thermal monitoring system to disconnect it in case of blocked cooling vents or near short-circuit impedances (less than 1 ohm continuously). Both the transformer and Alpha One is designed to support full continuous power in all channels at ambient temperatures up to 35 degrees Celsius. Besides thermal protection the Alpha One is secured against component damage caused by short circuits. Alpha One is equipped with a 15 amperes local main relay which disconnects the individual module block if it consumes more than 3450 watts. Besides the 15 amperes local main relay, Alpha One is equipped with 2 pcs. 10 amperes fuses which monitors the supply voltage - one for the positive and negative supply rail. Cinnova Grande is additionally equipped with a 25 amperes global main relay. Cinenova Grande is protected against short circuit, transistor burning and other internal errors (open circuit). Besides protecting themselves, Cinenova Grande secures against forwarding DC to the speakers, and on / off transient protection (ensuring that the amplifier is not making loud noise in the speakers at start up). The amplifier's rear panel houses the instrumentation for the protection circuits. The instrumentation is built around FFI (Fused Fault Indicators) technology. Each Alpha One module block has two Fused Fault Indicators which lights up if a parameter is exceeded. FFI monitors the condition of the two 10 amperes voltage controlling local fuses. Cinenova Grande is able to accept both balanced XLR connections and general unbalanced RCA signals. Its implementation in Cinenova Grande separates it from other manufacturers. Traditionally, RCA and XLR inputs are mounted parallel to the same signal path and both inputs are active all the time. That means using the XLR inputs the RCA input acts as a small outdoor antenna and adds noise to the signal path. Cinnova Grande has a switch which disconnects the unused input. This ensures a closed signal path free from extraneous noise which is essential for a true balanced design to operate optimally. We hope that the above introduction to the Cinnova Grandes universe has inspired you. 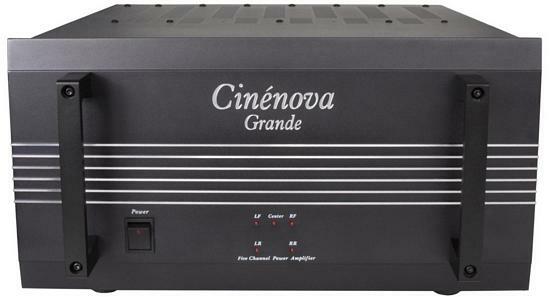 It is our belief that Cinenova Grande is one of the world's best power amplifiers, regardless of price.